And Threadsy does that incredibly well. 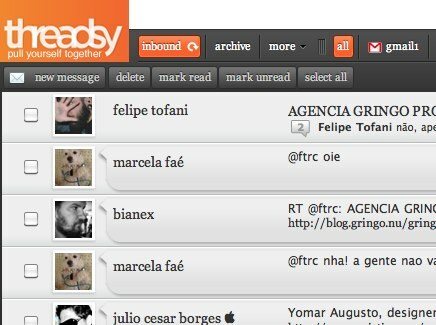 Threadsy takes your email and social networking accounts and aggregates them all into one, single interface. The sheer number of types of mail accounts supported here are incredible, Hotmail, Yahoo, Gmail, Google Apps, even straight up IMAP servers. 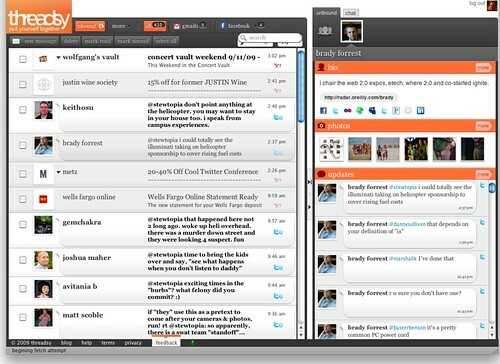 Threadsy also includes support for social networking sites such as Facebook and Twitter. The result is an interface that is truly incredible. Many shots of the interface are all over the Internet. The clear polish of this tool is evident in many of the interface elements on display. From the support for a number of accounts, to the ability to rename mail accounts to short names to the support for multiple Twitter accounts. This is the kind of aggregation you need if you hold a number of email addresses or Twitter accounts (and really, these days, who doesn’t)? Threadsy also does some of the things Brizzly does – like the automatic expansion of short urls (like bit.ly). Threadsy is currently an invite-only tool. You can request your invitation by providing your email address here (Note: The service is now offline). Give it a shot.